You now know that your child has celiac disease and you need to switch her to a gluten free diet as a treatment for this condition. As there is no medication for this illness, it is imperative that you accept this form of treatment so that your child recovers as quickly as possible. As must have been made clear to you by your doctor, the treatment of celiac disease demands absolutely NO gluten intake for life. Eliminating gluten implies a drastic change in the food habits and in the cooking style for most of us in North India. In addition, the realization that gluten is also present in some commonly used items creates confusion, worry and a question mark amongst all the parents, especially mothers. We have compiled basic, stepwise information which will help you make this transition. A guide in Hindi is also available. 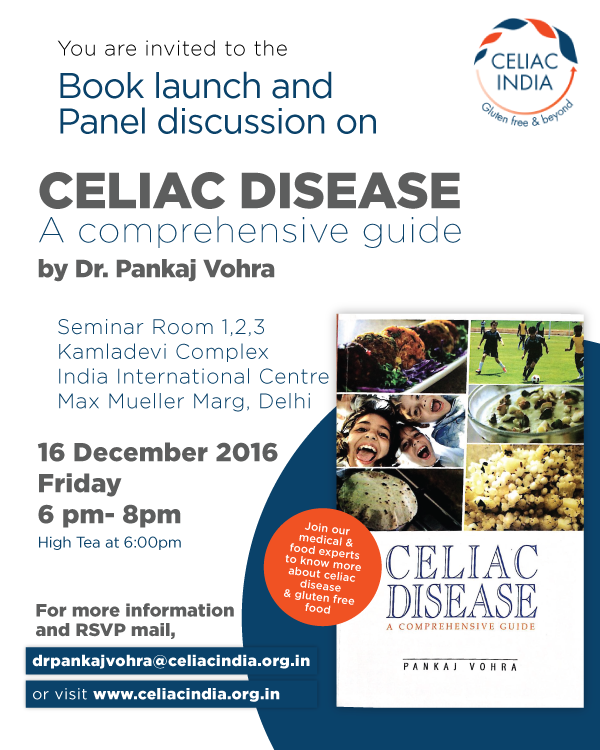 For any further questions or concerns, please write to us at glutenfree@celiacindia.org.in. We would be glad to help you and would love to learn more from your experience. Please keep in mind that celiac disease is not a disease but just a condition which only requires a strict adherence to the special diet. It is important to accept the diagnosis and the treatment as suggested by your doctor immediately as any delay would only cause harm to your child. Celiac disease if untreated can result into many complications. As can be seen from our video ‘Understanding Celiac disease’ (the video is available in Hindi and English), the nutrients absorbed in the proximal part of the intestine – iron, calcium, folate are the ones most affected in patients with celiac disease. If the disease progresses further, malabsorption of other nutrients including carbohydrates, fat and soluble vitamins may also result. Your doctor would recommend iron, multivitamins and calcium supplements which you should start immediately to take care of these nutritional deficiencies. But keep in mind that it is important to consume a healthy diet and obtain these nutrients through natural sources. It is important to understand about celiac disease from reliable accurate scientific sources and be prudent while relying on any non medical source including on the internet. Families who are dealing with this condition are the easiest sources of information. But keep in mind that due to lack of easily available information till recently, many families may not have accurate knowledge about the various aspects of this condition. We have also seen some families not being fully compliant with the diet. There are many myths too about celiac disease and gluten free diet which you should know more about. Learn more about Celiac disease, its symptoms, diagnosis and about gluten free diet. Read our FAQs for more. It is important to comply with a lifelong strict gluten free diet. A strict diet should result in positive response in just a few weeks in most cases. But even infrequent and small amounts of gluten ingestion will cause damage. Very often, after the initial period of compliance with the gluten free diet and recovery, patients start becoming lax about their diet. This non-compliance can lead to severe complications and hence it’s important to be consistently compliant and teach your child the same. Read about some of our patients’ experiences with non-compliance to the diet. ‘From where and how should I start preparing for a gluten free meal?’ is a question every new celiac mother asks. Read Gluten free cooking to learn how. It is important to educate the child, siblings and elders at home in the right manner which will help ensure compliance, obtain support and inculcate a positive outlook towards this new diet. Encourage them to read our section ‘for children‘ alongwith you. Be participatory – Involve the child depending upon her age in cooking, planning, reading about gluten free food. Provide alternatives – Gluten free alternatives of atleast some of her favorite food items will help in transition and compliance. Provide encouragement – Help the child become responsible for her diet. For teenagers, whether newly diagnosed or just entered their teens, involve them in planning their diet. Involve their friends as peer pressure is most critical for them at this age. Help them slowly become independent in managing their diet as they would soon be starting college and may be moving away from home. For older children, we have tips which you too would find useful. Being a relatively new disease in India, chances are that the elders may not be aware of this and may find it difficult to accept that wheat, a staple in our diet, can cause an illness and needs to be prohibited for life. We have seen that many grandparents are skeptical of this treatment initially but on seeing rapid improvement in their grandchild, they are gradually convinced. You could show them some resources and videos from this website. Some of the content is also presented in Hindi and other local languages which you may find of use. It is important to comply with this diet at all times, even when outside the house – whether at school, while dining out or even during holidays. Read here for tips. Spread the word and help build awareness about celiac disease and gluten free diet in your neighborhood, school, city, restaurants, hotels etc. Write to companies asking them about safe products.